Sergio graduated from a Paul Mitchell school in 2007. He started his career by working with Paul Mitchell National Educators in his first salon where they assembled an apprenticeship program to help in his technical growth. From the start, he attended as many advanced workshops he was able to attend in order to master skills like cutting, coloring and styling. After a few years behind the chair, he applied and was chosen to join the Paul Mitchell team as a National Educator!! He now travels to teach salons and schools new haircutting collections, trends, and product knowledge as well as working hair industry conventions and advanced workshops. With a style he calls a combination of classic, urban, and grunge, working behind the chair is his passion! He loves creating unique looks for his clients and “taking them through the seasons” by changing their haircuts and color palette throughout the year. He is consistently working on his technical skills and versatility by attending new certifications and assessments from the top hairstylists in the industry. Now the Owner and Artistic Director of Salon Masaya, his mission is to provide the best customer experience and to create “tailored hairstyles” that fit each client and reflects their own personal lifestyle. Paul Mitchell Hair Camp (Long hair design, Cutting Collection, Dimensional Foiling), Paul Mitchell “Mitch” men’s cutting collection, Paul Mitchell Balayage Lightening Technique, Paul Mitchell Creative Foil Placement, Paul Mitchell Men’s barbering , various Seminars/Expos/Demos, One on one training with a Paul Mitchell Educator, Masterful Manipulation of Light class and Color Theory & Placement with Misael Aponte. He also earned an associate’s degree in Liberal Arts with a focus in Psychology, and a minor focus in business during this time. When not at work, Jonathan is an avid hiker and travels when possible. He also enjoys reading, playing guitar and pursuing diverse interests. He recently traveled to Peru with long time friends to explore Machu Picchu, one of the Andes Mountains. Now a full-time Hair Artist, Jonathan focuses on providing a great experience for everyone of our clients. His most important goals as an artist is to ensure the healthiest hair while creating each client's desire into a tailored reality. 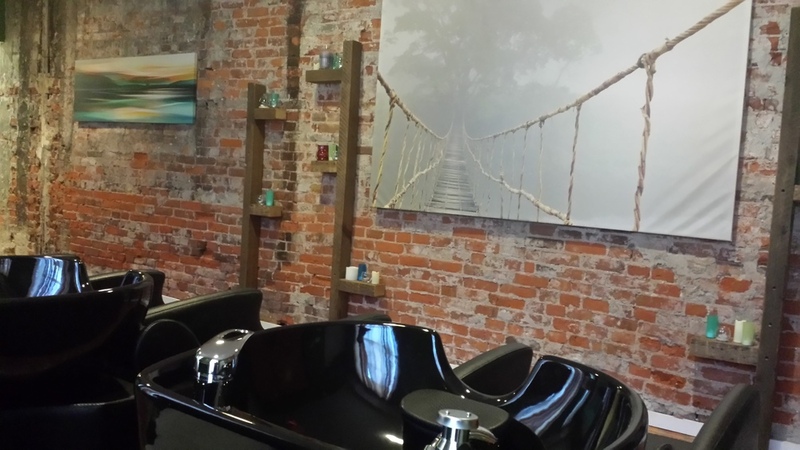 Maria began her career in 2007 and over time earned her chair at an award winning salon in Jenkintown. During that time Maria continued to educate herself through various classes, seminars and conventions, locking in certifications with Hot Heads, Keratin Complex and Masters of beauty with Nick Arrojo. In 2014 Maria went on to live in Kauai for 3 years, taking a step back from her rapid success in Jenkintown. Missing the industry, Maria returned to her roots in Philadelphia to re-light her passion as a Stylist. She has since taken additional classes as part of Salon Masaya in dry hair cutting, creative hair cutting, and balayage. Lucy, a.k.a. "Goose", is a 7 yr old Boxer-pit mix who was adopted by Sergio 2 years ago. They are now inseparable! She LOVES coming to work with dad and has earned the title of receptionist from her undying desire to greet every single client personally! When she isn't greeting you ,and sitting on your feet while receiving affection, Lucy loves to eat, she sleeps a lot , and take very short walks in between clients. She is also know to drool heavily if she gets wind you have a treat for her (it's really funny!) Her calm and sweet personality will surely win your attention. She also loves when you pop in unexpectedly to say HI!